Every individual person has different motivations for working at a job. The reasons for working are as individual as the person. But, all people work because the workplace provides something that you need from work. The something that you obtain from your work impacts your morale, your motivation, and the quality of your life. 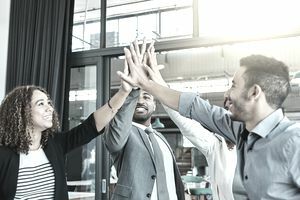 Here are thoughts about employee motivation, what people want from work, and how you can help employees attain what they need for their work motivation. Some people work for their love of the work; others work for personal and professional fulfillment. Other people like to accomplish goals and feel as if they are contributing to something larger than themselves, something important, an overarching vision for what they can create. Some people have personal missions they accomplish through meaningful work. Others truly love what they do or the clients they serve. Some like the camaraderie and interaction with customers and coworkers. Other people like to fill their time with activity. Some workers like change, challenge, and diverse problems to solve. As you can see, employee motivation is individual and diverse. Whatever your personal reasons for working, the bottom line, however, is that almost everyone works for money. Whatever you call it: compensation, salary, bonuses, benefits or remuneration, money pays the bills. Money provides housing, gives children clothing and food, sends teens to college, and allows leisure activities, and eventually, retirement. Unless you are independently wealthy, you need to work to collect a paycheck. To underplay the importance of money and benefits as motivation for people who work is a mistake. It may not be their most significant motivator or even the motivational factor they'd first mention in a conversation but earning a living is a factor in any discussion about employee motivation. Fair benefits and pay are the cornerstones of a successful company that recruits and retains committed workers. If you provide a living wage for your employees, you can then work on additional motivation issues. Without the fair, living wage, however, you risk losing your best people to a better-paying employer. In fact, research from Watson Wyatt Worldwide in "The Human Capital Edge: 21 People Management Practices Your Company Must Implement (or Avoid) to Maximize Shareholder Value," recommends, that to attract the best employees, you need to pay more than your average-paying counterparts in the marketplace. Money provides basic motivation. Got Money? What's Next for Motivation? Surveys and studies dating back to the early 1980s demonstrate that people want more from work than money. An early study of thousands of workers and managers by the American Psychological Association clearly demonstrated this. Managers predicted that the most important motivational aspect of work for people they employed would be money. Instead, it turned out that personal time and attention from the manager or supervisor was cited by workers as the most rewarding and motivational for them at work. In a "Workforce" article, "The Ten Ironies of Motivation," reward and recognition guru, Bob Nelson, says, "More than anything else, employees want to be valued for a job well done by those they hold in high esteem." He adds that people want to be treated as if they are adult human beings who think, makes decisions, tries to do the right thing, and don't need a caretaker watching over their shoulders. Control of their work inspires motivation: including such components as the ability to have an impact on decisions; setting clear and measurable goals; clear responsibility for a complete, or at least defined, task; job enrichment; tasks performed in the work itself; and recognition for achievement. To belong to the in-crowd creates motivation: including items such as receiving timely information and communication; understanding management's formulas for decision making; team and meeting participation opportunities; and visual documentation and posting of work progress and accomplishments. The opportunity for growth and development is motivational: and includes education and training; career paths; team participation; succession planning; cross-training; and field trips to successful workplaces. Leadership is key in motivation. People want clear expectations that provide a picture of the outcomes desired with goal setting and feedback and an appropriate structure or framework. In "The Human Capital Edge," authors Bruce Pfau and Ira Kay say that people want recognition for their individual performance with pay tied to their performance. Employees want people who don't perform fired; in fact, failure to discipline and fire non-performers is one of the most demotivating actions an organization can take—or fail to take. It ranks on the top of the list next to paying poor performers the same wage as non-performers in deflating motivation. Additionally, the authors found that a disconnect continues to exist between what employers think people want at work and what people say they want for motivation. "Employers far underrate the importance to employees of such things as flexible work schedules or opportunities for advancement in their decision to join or leave a company. That means that many companies are working very hard (and using scarce resources) on the wrong tools," say Pfau and Kay. People want employers to pay them above market rates. They seek flexible work schedules. They want stock options, a chance to learn, and the increased sharing of the rationale behind management decisions and direction. You have much information about what people want from work. Key to creating a work environment that fosters motivation are the wants and needs of the individual employees. The most significant recommendation for your takeaway is that you need to start asking your employees what they want from work and whether they are getting it. With this information in hand, you'll be surprised at how many simple and inexpensive opportunities you have to create a motivational, desirable work environment. Pay attention to what is important to the people you employ for high motivation and positive morale. When you foster these for people, you'll achieve awesome business success.